Technically the Central Coast AVA runs from San Francisco to Los Angeles. We have chosen, for our purposes, to treat the Region as Santa Barbara County west of Lake Cachuma, San Luis Obispo County west of the San Andreas Fault in Parkfield, most of Monterey County, and a small piece of San Benito County surrounding Hollister. We’re going to handle Santa Cruz County separately in our Bay Area Region. As with all the wine Regions in California there is not much getting around the need for a car. The main automobile corridor through the Central Coast is Hwy 101. It is basically a two-lane freeway. I have always thought of the Hwy 101 trip from Los Angeles to San Francisco as straight north to south, 400 miles divided into four 100-mile, two-hour sections: one section to Santa Barbara; next section to San Luis Obispo; third section to Salinas; final section to San Francisco. It may be entertaining, although not enormously helpful, to realize Los Angeles is actually east of Lake Tahoe (Tahoe is on the eastern border of California in the northern third of the state). So actually, instead of a straight north-south shot with four sections, it is a lazy ‘L’ with the top running at a considerable diagonal, and the southern section running east-west. Interstate 5 is the major transportation artery from Mexico to Canada through the western US. Even big trucks average 75 to 80 miles-per-hour on I-5, and it is the most direct route from LA to the San Francisco Bay Area. For motivated drivers that trip only requires a little over six hours. Visually it is a study in Big Agriculture, a mildly monotonous high speed dalliance through the San Joaquin Valley. 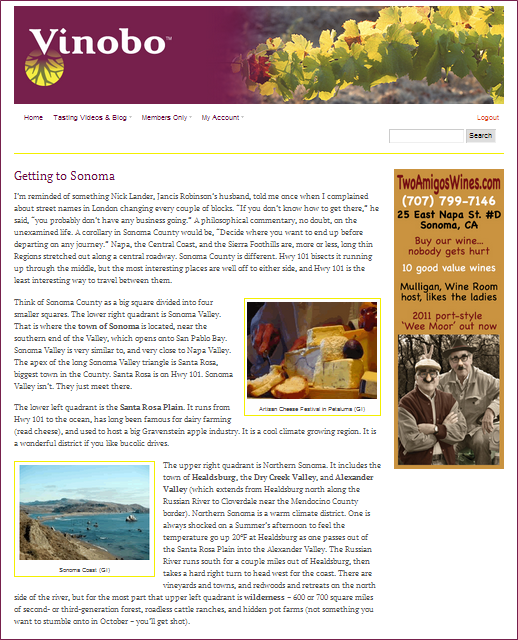 There are hidden attractions, and there are long, lonely routes from the Central Valley through the mountains to the Central Coast wine districts (see below). There are very good reasons the attractions remain hidden and these routes are obscure. Hwy 1 is the single lane road up and down the Pacific shoreline. It is inspirational almost anywhere in California, but not a good solution for getting from Point A to Point B. I strongly encourage visitors heading for either the Central Coast or to the North Coast to spend a couple of hours on Hwy 1. Just be sure you have plenty of gas, a cell phone, and a well maintained vehicle before you embark. Hwy 101 leaves Los Angeles traveling west rather than north. Just be aware, even though the 405 is the westernmost freeway past the airport and the beach at Santa Monica, it is actually bound for the Central Valley. Once you pass the Getty Museum in the hills, you need to exit west to Ventura. You don’t want the San Fernando Valley and Sacramento. You want Santa Barbara, which is about two hours toward the setting sun. Better to do it in the morning. After a couple hours, as you are leaving Santa Barbara, you can make a decision to stay on Hwy 101 through Goleta (along the coast with its many citrus and avocado groves) to arrive in the Santa Ynez Valley (the beginning of Santa Barbara’s Wine Country) at Buellton. The alternative is the State St. exit in order to take San Marcos Rd (Hwy 154) over the mountains into the eastern end of Santa Ynez Valley at Lake Cachuma. No time advantage either way, and they are both attractive, interesting drives. Do try them both at one time or another. The city of San Luis Obispo lies between Morro Bay and the Edna Valley on the cool, ocean side of the coastal mountains in southern San Luis Obispo County. At some point you probably want to drive through the Edna Valley, since that is where most of the vineyards and wineries are. Exit Hwy 101 in Arroyo Grande (sign says Grand Av) and travel north (to the right) through town on Hwy 227. Stay on 227 all the way into San Luis Obispo, where you can rejoin 101 if you choose. From San Luis Obispo, Hwy 101 north climbs the Cuesta Grade on its way to Paso Robles. If you have some time, two very interesting routes lie northwest of Hwy 101 bypassing the Grade. Exit north prior to (west of) SLO on Los Osos Valley Rd. Turn right just before the town of Los Osos (the bears) on Bay Rd toward Morro Bay. Turn left at the end to take Hwy 1 into Morro Bay. You could stay on Hwy 1 north to all sorts of fascinating sights (like Hearst Castle), or you might choose to make the right turn on Hwy 46 to travel back to Hwy 101 through the heart of the Paso Robles Wine Country. Alternatively, if you want a really pretty rural drive, past Morro Bay but just as you enter Cayucos, turn right on Old Creek Rd. Take that past Whale Rock Reservoir and up over the top of the ridge. What beautiful country. Turn right when you run into Hwy 46 (major road) to rendezvous again with Hwy 101 just south of Paso Robles. You’re going to want to be on Hwy 101 south of San Jose. How to best arrive there is subject to many interpretations. I’d go south out of San Francisco on Hwy 101, then hop over to Hwy 280 just north of the San Francisco Airport on the short connector labeled Hwy 380. Southbound Hwy 280 toward San Jose is a pretty drive through the most attractive part of the Peninsula. It parallels Hwy 101, but without as much traffic and office garflooey. Get off Hwy 280 down past Los Altos onto Hwy 85 southbound for Gilroy. Hwy 85 will merge with Hwy 101 south of all the traffic. Once you pass Gilroy your initial destination will guide decisions for an exit on Hwy 25 bound for Hollister, vs. an exit on Hwy 156 west toward the Monterey Peninsula via Castroville (Artichoke Capital of America, and site of several escargot farms). Did you know Marilyn Monroe was once Artichoke Queen in Castroville. Staying instead on the Hwy 101 freeway will take you into Salinas, which is the northern end of the Salinas Valley, and also the fastest route to Carmel Valley. Salinas is a fairly direct path to the Monterey Peninsula too, although it is not the fastest route (Hwy 156 is). As you drive south on Hwy 101 through the Salinas Valley there will be a small bridge across the Salinas River just before entering King City. Immediately before the bridge will be an exit for Jolon (YO lawn) Rd. It will run parallel to 101 through the western side of San Bernabe, the largest contiguous vineyard in the world. It will also run past Fort Hunter Liggett, the largest land area Army Reserve Command in the US. Mission San Antonio de Padua is on their property. This Jolon Rd diversion takes about 40 minutes, loses little time compared to 101, which it rejoins right about where the river tributaries from Lake San Antonio and Lake Naciemento flow into the Salinas River. The last 15 miles of Jolon Rd traverse an otherwise obscure AVA [LINK to GLOSSARY ENTRY] called Hames Valley. Unless you live in Fresno or Bakersfield, I’m going to guess you will have few occasions to travel from I-5 to the Central Coast. But who knows? Maybe you leave LA some evening, and get a wild hair three hours later while listening to some truckers in a coffee shop hold forth on the unfortunate demise of James Dean 60 years prior. Or maybe you’re a seismologist, and want to see the San Andreas Fault in action. There is a route (Hwy 166) from south of Bakersfield past the Carrizo Plain to Santa Maria. It is a very long, arid, and desolate trip. Cuyama, high in the mountains in the middle, is home to the California Condor. The Carrizo Plain has its moments each year with enormous blooms of wildflowers in the Spring. The judicial outpost at Taft supports the whole region on speeding ticket income from drivers who had no business being in the area to begin with. From Paso Robles, a lane (Hwy 46) diverged in a wood (desolate pastureland really), and I … I chose the path less traveled (tough choice, neither 46 nor 41 go anywhere). That has made all the difference. (No it hasn’t.) If you had been in Yosemite, and wanted to go to Paso Robles, you would have stopped for a fabulous steak at Harris Ranch on Hwy 5, and asked somebody for directions. It would still have been another two lonesome hours with bad radio reception. There is a route (Hwy 198) from Coalinga to King City in the Salinas Valley, but even I haven’t been on that one. And I was in love for years with a very bright Valley Cracker who grew up in Coalinga. Pacheco Pass (Hwy 152) is the one road I think is worth seeking out. It is a relatively short trip. It affords a good look at several features in the Central Valley’s magnificent plumbing system. It goes from Yosemite, the Sierra Foothills, and the Central Valley nexus between Sacramento and Stockton to the southern Santa Clara Valley, Santa Cruz, and Monterey. All those places are well worth your attention. So are the Basque family-style restaurants in Los Banos. There are airports in Monterey, San Luis Obispo, and Santa Barbara but service is infrequent, unreliable, and expensive. In terms of money, travel time, and convenience it is almost always better to fly into LAX (Los Angeles Intl.) or into San Jose Intl, and then to rent a car. Amtrak runs a train back and forth from San Diego to Seattle called the Coast Starlight. As a form of business transportation it is way too slow and infrequent. As a technique to see the countryside, however, it is brilliant. It’s comfortable, and it goes through lots of property which people in automobiles never get to see. The route from Los Angeles to San Luis Obispo goes right along the shoreline for much of the distance, and the route from Oakland to Sacramento goes through a spectacular wetland. Trains leave daily. The whole trip (one-way LA to Sacto) costs under $100, and it can be taken as individual segments. So you could get off for a day or three to rent a car and visit wineries anywhere you want. From the south, note that Union Station in Los Angeles is a tremendous piece of architecture, worth a visit on its own whether you’re catching a train or not. Moreover, Union Station is only 75 yards from Olvera Street, which is part of the original Pueblo de Los Angeles. There are 27 historic buildings lining what was originally called Wine St. It’s now an entertaining Latino bazaar with several good restaurants, and lots of souvenir shopping. But it was once the market where Jean Louis Vignes came to sell the product from his nearby vineyard, the first secular one in California (1820). In the north, note you will want to be catching the Coast Starlight either in San Jose (same station as the local train from San Francisco) or at a station in Oakland (Jack London Sq. or Emeryville). Neither of these Oakland stations are serviced by the Rapid Transit system from San Francisco (BART, which goes instead to the Oakland Coliseum). There is a bus connection, but be aware the situation lacks even elementary school logic. Make no assumptions. The tyranny of petty bureaucrats is incredible, and Amtrak can compete with a French Post Office on any given day.